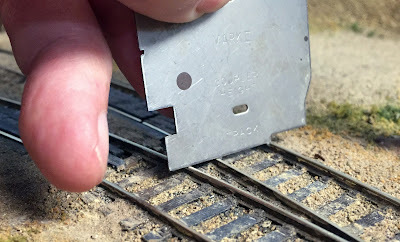 In previous posts, I have commented in several cases about the issues and challenges of maintaining trackwork on an older layout like mine, the earliest of which posts was about a track realignment problem (that post is available at the following link: http://modelingthesp.blogspot.com/2016/09/trackwork-wars.html ). There were also a couple of posts about developing a technique to remedy sags in track, some of which have developed on my layout over time (see that post at: http://modelingthesp.blogspot.com/2018/05/fixing-sag-part-2.html ). But the present post is strictly about track gauge. 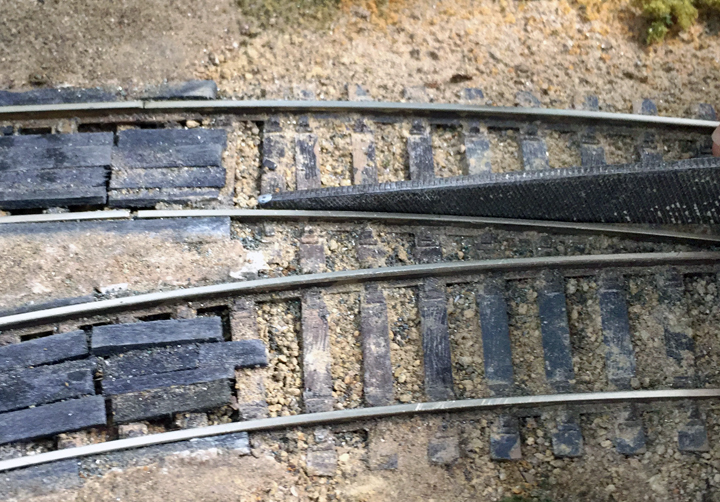 Parts of my layout are decades old, though other parts are less than a year old. It might be deduced that any track issues in the older parts would have been dealt with long ago, whereas the newer areas might contain undiscovered gremlins. 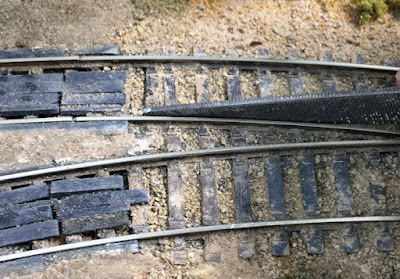 Well, in fact, some of those new gremlins do surface from time to time, but surprisingly (to me, anyway), there are also variations in track gauge in older parts of the layout. These problems are primarily in turnouts. Much of my layout was built with Shinohara turnouts, and for the most part these have been dependable (a few exceptions have been rebuilt to use Frog Juicers, as related in previous posts: http://modelingthesp.blogspot.com/2016/12/electrical-wars-part-12-new-turnout.html ). In the earlier days of the layout, there were no commercial No. 5 turnouts, so I purchased the “kit” turnouts sold by Russ Simpson. These are gorgeous turnouts in Code 70 rail, all of which I laid with individual wood ties, and not one has ever given any trouble. More recently I have installed some Peco turnouts, and generally speaking, I like these and recommend them to others. But: some of them are showing track gauge problems. I check, as I have always done, any new turnout before installing it, for accurate gauge. This habit was developed 30 years ago, when a small proportion of Shinohara turnouts would regularly happen to be tight in gauge. These were pretty hard to fix, so I simply discarded the bad ones and bought new ones. The point here is that I developed the habit to check, and even with my new Peco turnouts, I still carefully checked track gauge throughout before installation. A couple of them must have shrinking ties or shrinking support underneath, or something, because they gradually have gotten tight in gauge, usually in the frog area. Once that happened, I used a flat file to carefully remove material on the inside of the offending rails, and restored the gauge. But recently two of them are again tight in gauge. I can only think that ties are still shrinking. I doubt it’s the support structure shrinking, because other track in the area remains fine. Of course, fixing the problem is fairly simple. First, make sure to identify exactly where the tight gauge exists. Here I’m checking near the frog, with my old Mark II NMRA gauge. Next I check along the track to the end of the Peco turnout, same gauge, same method. Having found an area about half an inch long that is a little tight in gauge, I bring out a flat file and grind off a little material, re-check the gauge until it is all okay. I should not leave the impression that there is anything wrong with Peco turnouts, as practically all of the ones I have on the layout do work fine. Nor should I leave the impression that problems don’t happen with other turnouts. As I mentioned above, I have had to rebuild four Shinohara turnouts due to inadequate electrical performance, though there are probably 20 other Shinoharas on the layout that are fine. It is only my Simpson No. 5 switches that have been utterly problem free. I continue to feel surprise that this turnout gauge problem is cropping up, and it seems to require vigilance to keep it under control, but both the check and the fix are easy, so not a real burden. And of course the reward is that operation in this area now works fine.